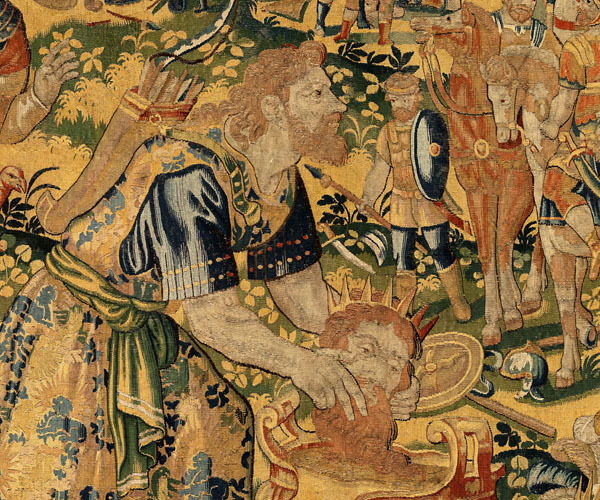 Three tapestries from a series of six telling the history of the Persian King Cyrus II ‘the Great’ are currently displayed in the Royal Palace of Aranjuez. The pieces were produced in Antwerp towards the end of the sixteenth century. However, they probably only became part of the royal collection much later, during the reign of Charles III, since they appear in his will of 1788. The National Heritage collection keeps two series telling the story of Cyrus II, commonly known as Cyrus the Great. 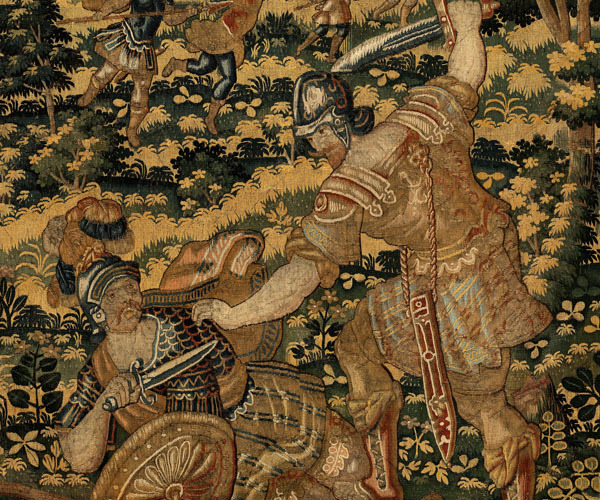 The older of the two, which is not currently on display, is formed of ten tapestries produced in Brussels. The cartoons for this first series (number 39 in the National Heritage catalogue) are attributed to the painter MichielCoxcie and dated to the middle of the sixteenth century. 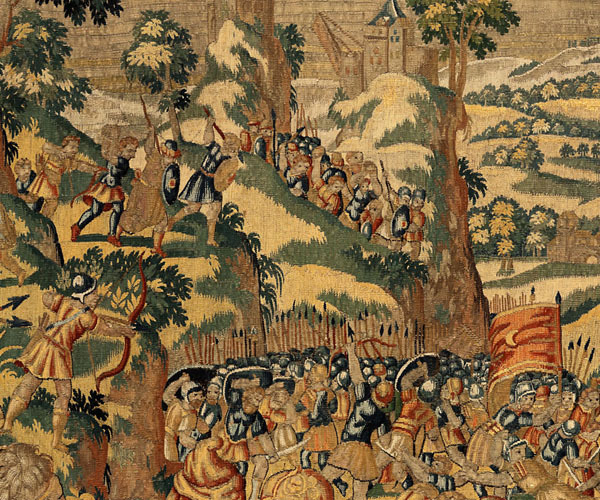 An anonymous – and less talented – painter created new cartoons based on Coxcie’s, which were used to create a separate tapestry cycle. This second cycle (series 40 in the catalogue) is made up of six pieces, of which three are displayed. 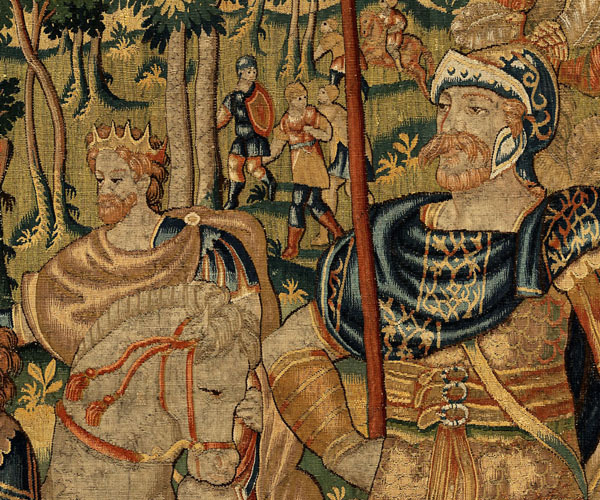 The second series was known as “Little Cyrus” in the Royal Tapestry Office. Cyrus the Great, a member of the Achaemenid dynasty, founded a great empire in the sixth century BC. By the time he died in 530 BC, the lands he controlled stretched from the Mediterranean Sea to the River Indus. The empire, which was expanded yet further by his son Cambyses II, continued to thrive until the invasion of Alexander the Great two centuries later. 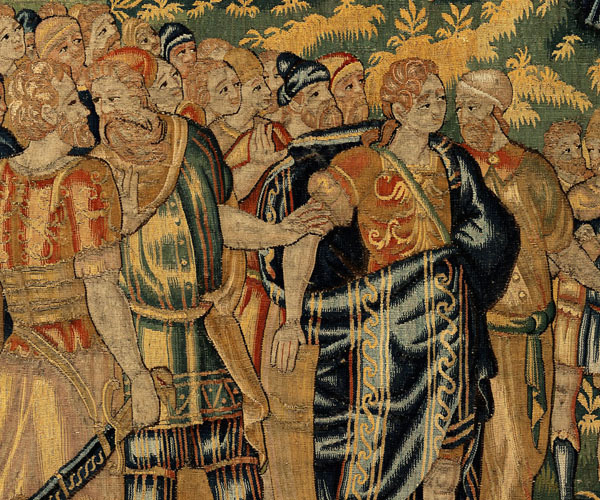 The exploits of Alexander the Great and Cyrus II, handed down through ancient writers, were depicted very often in all art media, especially tapestry series. These six pieces telling the Story of Cyrus were produced in Antwerp around 1590. Although marks appear on two of the tapestries, the workshop which they represent has not yet been ascertained. They are made of silk and wool, whereas the ten pieces of the first series (number 39 in the catalogue) also include silver and golden thread. The first series was probably commissioned by Philip II. P. Junquera de Vega, “Tapices de PatrimonioNacional. Historia de Diana y Ciro”, Reales Sitios, XII (1975), pp. 40-50.